If the best chefs are born, then Chef Sau del Rosario came in this world with a silver spatula in hand. This native son of Pampanga has traveled through Europe and Asia, honing his craft. 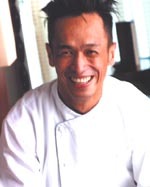 Refining his tastes and skills to the point that he is now considered one of the Philippines’ most innovative and in-demand chefs, Chef Sau is currently developing new dishes for M Cafe’s menu. The new and improved menu will debut on November 25. Blame it on genes. My grandfather and my father were chefs too. But it was my mother who taught me the ABC’s of cooking. She was a great cook. At age 5, I learned how to prepare Rellenong Bangus! La Riviera by Alain Ducasse. He’s my chef icon. I like the book because it’s so personal. When he was living in Monaco, I had the chance to meet him. He cooked for me and signed his book which I brought from Nice, where I was working and living. During my high school days, I baked some brownies and pineapple upside-down cake and sold them to my classmates. I also charmed some “girls” with them. That was then. What is your inspiration for the new menu of M Cafe? M Cafe’s menu is very special for me because these are the things that I have learned from my travels. My source of inspiration comes from people I meet, cultures that I embraced and events I participated in. With the new menu, I dug into my childhood memories, my mom’s recipes, my Tita Linda’s food in Shanghai, Ittichai’s Thai elements and Sam’s Chinese influences. What are your favorite items on the new menu? Nori Crusted Black Cod, Edamame Puree, Soy Yuzu Glazed Sauce. This is my signature dish which I featured in Paris, Singapore, Thailand and in M Cafe. It is always the bestseller. It was featured many times in magazines and I even taught the recipe to my nephews in Las Vegas since they loved it. I hope they keep it and pass it on to the next generation. I went to Jules Verne to meet the Michelin chef, Alain Reix in the Eiffel Tower in Paris during my first trip there. I met the chef when he did a promo in Cheval Blanc in Shangrila a long time ago. I remembered he told me if I go to Paris to give him a call and he would show me the city. So years later, I did and he treated me a seven course degustation with wine pairings in this wonderful restaurant on the top of Paris! Ooh lah lah. Mamou. I love the food. I love the chef. I just love everything. Plus, add Zhong to my list. I love the Itlog na Maalat Crusted Fried Chicken and lots more. Josh cooks so good! I love my Fruit Salad with Nestle Cream in the morning, for merienda and before going to bed! In fact I buy cans and cans every Saturday at Rustans Rockwell! The food that is served in one restaurant in Serendra! I wonder why it is always full. Clue: order the pork chop. It tastes like the swelas(sole) of a shoe! To write a cookbook before I die. it's fun reading about chef sau -- i'm a fan! I'm also a fan of M's food :) Love the Jules Verne story! I'm a fan of Chef Sau. But sometimes, not so much of M cafe. Honestly, I'm glad that the menu is getting a make over. Great interview! Chef Sau's smile in the picture is such a happy smile. He seems like such a nice guy. Swelas na porkchop? sa conti's! lasang swelas? kelan ka una nakakain ng swelas? lol! Where exactly in Pampanga is this new resto Kingdom Thai? Directions pls. Thanks. he shared with me his special fruit something something (i forgot how he called it) -- sarap. i had fun reading this. sau ha ha great person. we had beers years back and of course french fries ha ha. he showed me his scars from cooking while in beijing. hai mr.chef sau.i'm michael vergara,frm.pangasinan..i saw you at jesica kapuso that's why i'm posting a comment at this site.i'm interested to spent my time to learn in your resto.magttraining ba.kc all of my ojt is more on beds and housekeeping,..f you dont myn sir i want you to be my master.i make my face so kapal,kc i'm already 23y.o.but i dont have work experience yet..tanx master.hope you can appreciate my comment..
meron bang nakakaalam nung address ng food garage bread station ni chef del rosario sa makati?